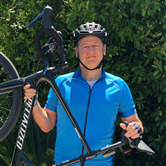 After learning about this ride last summer from my Adaptive Insights co-workers, I thought this would a great personal challenge to help a wonderful cause . I’ve been training diligently since early April and I’m excited about the ride coming up soon. Thanks for your support in helping the PMC raise funds that go directly to support the Jimmy Fund and Dana-Farber Cancer Institute's tireless commitment to finding a cure.